We’ve designed our business from the perspective of a client. The only fee we charge is our annual advisory fee. Our goal is to provide advice that is free from conflicts of interest. We deliver exceptional value by having our fee low enough that you get to keep most of your investment returns and still get the professional investment management and financial guidance that delivers returns across the full spectrum of your financial life. Our annual advisory fee is charged as a percent of the assets that we manage. The fee is calculated and deducted from your portfolio quarterly. We always bill in arrears—no fees are charged in advance. Generally, the greater the value of your portfolio the lower the incremental percent of the fee. It will normally run between 0.25% annually for larger portfolios to 1.00% annually for small portfolios. The fee covers both our financial planning and investment management services. There is no separate charge for one or the other. We do not accept any other form of compensation. 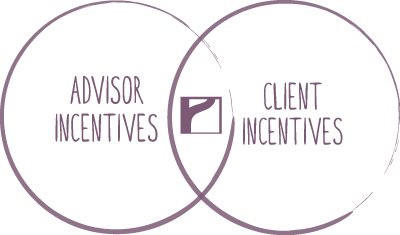 At Plum Street Advisors, we’ve structured the business to ensure that the incentives of the advisor and the client are aligned. The only revenue we receive is the annual advisory fee that we charge our clients on a quarterly basis. We don’t receive any commissions from any products we recommend. We don’t receive any fees for referrals we make. We don’t receive any “soft-dollar” compensation for recommendations we make. We strive to make recommendations to clients that are absent of any conflicts of interest because we’ve structured the business to ensure that we have nothing to gain from making any specific recommendations. What’s more, we believe our entire business model is rare in the finance industry. We don’t start from the perspective of selling products, or hiding costs, or charging as much as other competitors. Instead, we ask, what’s a fair price for our services which reflects the value added and preserves true value for the client? We believe the answer is around 0.25% to 1.0% per year. We don’t have to oversell our capabilities as investment managers or take unnecessary risks trying to outperform other advisors. Instead, we present ourselves as a professional services firm— much like an accountant or an attorney. Moreover, these assumptions ignore the time saved by clients in not having to manage their investments or do their own financial planning.The reality is that most busy people do not have the time or knowledge to do so. Consequently, important financial issues are never addressed. We make sure those issues are addressed, and that is perhaps the most valuable thing we do. What we provide is high-quality, high-value guidance and service. We help you manage all aspects of your money. Investments are a big piece, but they’re only a piece. Good investment return that doesn’t provide liquidity to help pay for your kid’s college or prepare you for retirement isn’t really good investment advice. None of these decisions should be divorced from one another. Financial planning and investment management are each integral pieces of your complete financial picture. As a professional services firm, we help you manage that complete financial picture. And this is where the real value of our service lies.